The challenges we face these days are so great that we cannot rely entirely on ourselves, our communities, or our organizations to support us and help us stay on track. We need a small group of people with whom we can have in-depth discussions and share intimately about the most important things in our lives. 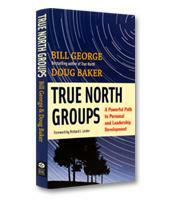 For the past thirty-five years, Bill George and Doug Baker have found the answer in what they call True North Groups. George and Baker explain why True North Groups are so critical to helping us develop the self-awareness, compassion, emotional intelligence, and authenticity required to be inspired human beings and inspiring leaders. In 1975, when Bill George was a rising star in Hewlett Packard (HP), on the fast track to the culmination of his dream of leading a large corporation, he and a few friends began meeting weekly in the living room of a church. George’s life took some unexpected twists and turns in the 36 years since that meeting — notably, leaving HP for a successful career as CEO of a much smaller medical equipment company and becoming a best-selling author and speaker on leadership — but the weekly meetings with the men’s group in that church have remained constant throughout. (Eventually, the core group of friends would also form a couples support group.) Co-authored with fellow group member Doug Baker, George’s latest book, True North Groups, is not only a manual on how to create such groups, but also makes a compelling case as to why everyone should have such a group. As the authors explain, the phrase True North, which George coined in his previous book of that name, refers to "our beliefs, our most cherished values, our passions and motivations, and the sources of satisfaction in our lives." True North Groups, then, help members stay true to their values and dreams. Willing to listen without judgment but also willing to speak the truth, True North Group members help each other surface and share deep personal issues or feelings, and navigate through life’s inevitable frustrations, confusion and hard decisions. George recounts, for example, how one day he realized he was miserable in his high-flying job at HP. He had lost the passion and motivation for the hard-driving corporate lifestyle, and he was not living up to his values and beliefs. That feeling was confirmed first by his wife, and then by the members of the group who suggested that he look again at an offer from Medtronic. His subsequent decision to leave HP for the smaller medical equipment company would prove to be the turning point of his life. In the core chapters of the book, the authors offer a how-to manual for creating and sustaining True North Groups, adapting the familiar group process of forming, norming, storming and performing. "Forming" covers the issues involved in creating the group, including selecting the right members. In the "norming" phase, the founding members explicitly establish the group’s norms — the rules, values, behaviors and taboos of the group. Confidentiality, respecting differences and not judging others are some examples. "Storming" involves handling the inevitable conflicts in the group, which can be caused by behaviors such as lack of member commitment, lack of trust or violation of the group’s values. When the group is "performing," it has achieved the trust, commitment and positive chemistry of productive True North Groups. The authors add a last phase, reforming, which covers how to deal with new and departing members, or how to recognize if the group needs to be disbanded. At the end of the book a series of resources on specific topics, such as how to facilitate groups, garner feedback or add new members, complement the earlier chapters. The authors support their True North Group methodology with examples from a wide of range of people involved in a variety of True North Groups. These often moving and sometimes shocking examples — one group of young CEOs helped a member deal with the murder of his sister — illustrate the power of True North Groups. Many readers will be inspired to find those intimate close friends with whom they can form their own True North Groups.